1965 was a turning point in the history of music – year zero in a revolution launched when Bob Dylan went electric, releasing Bringing It All Back Home, an album that was controversial, genre-busting – and now a classic. 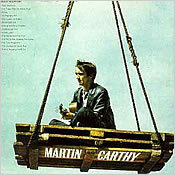 Folk became folk-rock and other albums that year by Joan Baez, Judy Collins, The Byrds and Phil Ochs – and in Britain, Martin Carthy and Bert Jansch – bear witness to the importance of the folk revival that was nurtured in the clubs and coffee houses around Washington Square and spread across the United States and around the world. 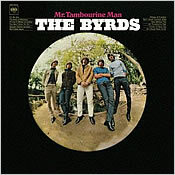 The following year, 1966, gave us classics from Simon & Garfunkel, Tim Hardin, the Incredible String Band, Bert Jansch and John Renbourn and of course Dylan’s Blonde on Blonde, where New York met Nashville. 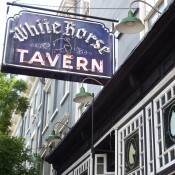 The hits go on and on, each subsequent year bringing forth seminal albums, released in both Britain and America, based on music which went west, from the Old World to the New, taking root in rural communities in Appalachia and beyond and flowering in the 1960s urban folk revival whose beating heart was Greenwich Village. These are anniversaries to be celebrated… Come join us for the Folk City Music Festival. 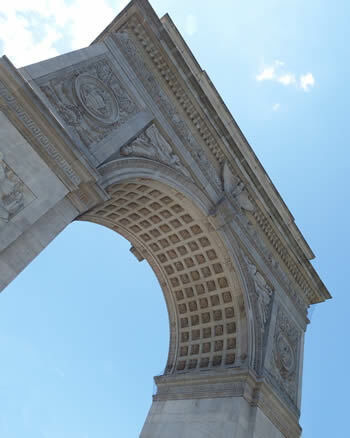 Our intention is to recreate, re-imagine and bring it all back home to Washington Square and Greenwich Village with a music festival and celebration spanning five decades of music, new and old, and in so doing acknowledge, appreciate and importantly create a legacy of this incredible musical journey for the future. 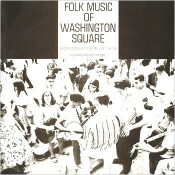 This 1962 album from Smithsonian Folkways presents some of the music one might have heard in Washington Square Park on a Sunday afternoon in the early 1960s. 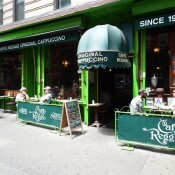 From bluegrass, ballads, and blues to children’s songs and Spanish guitar, this collection represents Greenwich Village’s vibrant amateur music scene. Listen here. The festival will celebrate the time, the place and the people with a weekend of music and associated events, talks, informal gigs, an exhibition, and performances by musicians whose musical roots can be traced back to this, the hub of the New York folk revival. 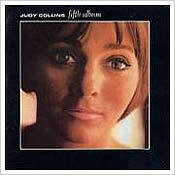 From it will be created an online archive, library and inspiration for future generations of musicians and music-lovers. Taking place in the Square and in concert halls and theatres around the Village, as well as the handful of remaining clubs from which the revival sprang, the festival will be an homage to the spiritual and geographical heart of the music as much as to the generation itself. 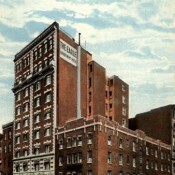 Joan Baez and the Indigo Girls talk about ‘Diamonds & Rust’ and the Hotel Earle, immortalised in the song as “that crummy hotel over Washington Square”. 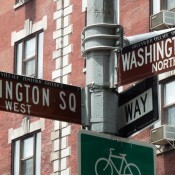 It’s now transformed into the chic and charming Washington Square Hotel, over which the Paul family preside. 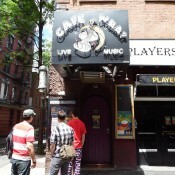 Despite its singular significance in musical history, no major celebration has taken place in Greenwich Village. Yet in the wake of feature films and documentaries and the success of such bands as Mumford & Sons, interest in folk, country and Americana is once again at a high. Bringing It All Back Home to Washington Square will mark 50 years since Bob Dylan’s electric debut at Newport, Joan Baez’s Farewell Angelina, The Byrds’ Mr Tambourine Man, Phil Ochs’ I Ain’t Marching Anymore, Judy Collins’ 5th Album and Paul Simon’s solo outing, as well as the eponymous debuts in Britain of Martin Carthy and Bert Jansch. 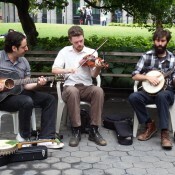 The Museum of the City of New York is curating an exhibition, Folk City, in 2015. Watch Elizabeth Thomson, in Washington Square Park, talking about Bob Dylan and the 1960s Greenwich Village music scene. Jac Holzman, founder of Elektra Records, talks about the night Bob Dylan was booed off the stage at the Newport Folk Festival in 1965. Bringing It All Back Home is the brainchild and passion of Liz Thomson, a London-based journalist, author and broadcaster and lover of the folk revival. 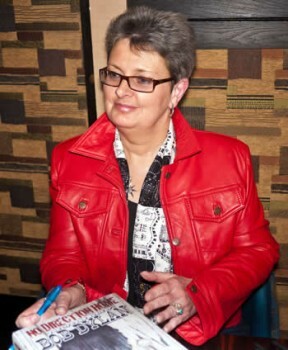 She has written widely for newspapers and magazines, including, The Times, the Washington Post, Q and Mojo, for whom she reported on the Joan Baez sessions for Ring Them Bells at the Bottom Line. 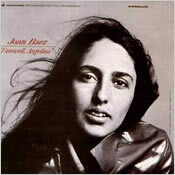 She has interviewed leading figures from the period, including Baez, Janis Ian, Judy Collins and Leonard Cohen. 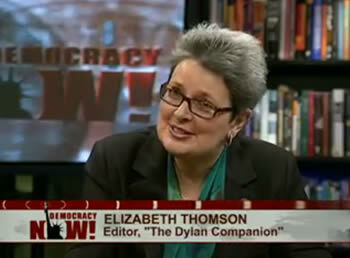 As Elizabeth Thomson, she was the co-author (with David Gutman) of The Dylan Companion, and she was responsible for preparing “the author’s cut” of No Direction Home: The Life and Music of Bob Dylan by her friend and mentor Robert Shelton, the late New York Times critic who chronicled the Greenwich Village folk years and whose review of Bob Dylan playing at Gerdes Folk City is credited with launching his career. 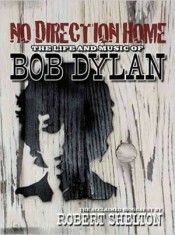 Originally published in 1986 and “abridged over troubled waters” according to its author, the 2011 revised edition restored much material about Dylan himself and the wider socio-political and musical milieu from which he sprang. 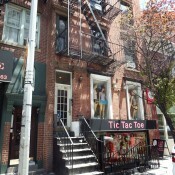 The new edition was launched at the Washington Square Hotel on Dylan’s 70th birthday. Mike Luba, founder of Madison House Inc, is a New York-based producer and promoter whose many credits include Pete Seeger’s 90th birthday party at Madison Square Garden, with Joan Baez, Steve Earle and Bruce Springsteen, as well as Seeger himself. His work on the tour and movie Big Easy Express with Edward Sharpe and the Magnetic Zeros, Mumford & Sons and Old Crow Medicine Show won him a Grammy. Last year he succeeded in reopening Forest Hills Tennis Stadium as a concert venue, raising $1m for the task. 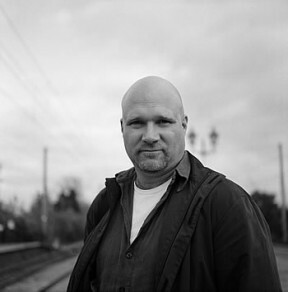 Over the course of two decades, Detroit-born, London-based Steve Cole has amassed a wealth of directing and producing experience ranging through arts, music, history and biography. His subjects have included The Beatles; Stuart Sutcliffe, the Beatle who left to follow his calling as an artist only to die tragically young in Hamburg; Roy Orbison; ABBA; Maria Callas; Placido Domingo; Werner Herzog and Greta Garbo. The Beatles in ‘LOVE’ explored the collaboration between the band and Cirque du Soleil, leading to the creation of the hit Las Vegas show and album Love. Anthony Keates is a freelance marketing and publicity consultant who has worked extensively in the entertainment industry for over 25 years. An expert business-to-business builder, he has worked with the BBC, Universal Studies, Warner Brothers, HBO, ITV, The Beatles, The Rolling Stones, Genesis, Monty Python, Stephen King, Terry Pratchett, George R R Martin, Ian Rankin and Harlan Coben. He has also worked on TV series such as True Blood, Dexter, Rebus, Call the Midwife and the Hairy Bikers. 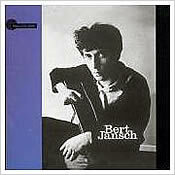 An obsessive music fan, he comes to this project as both a marketing professional and lover of the music. An hour-long special edition of Democracy Now! 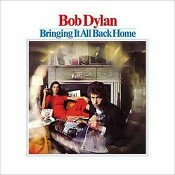 on PBS, celebrating Bob Dylan’s 70th birthday, features Bob Fass and Liz Thomson in conversation.